Harry Guanchez' Eugene Emeralds were down a run when he stepped to the plate in the sixth inning of this June 1990 game. When he was done, the score was tied, according to The Eugene Register-Guard. That's because Guanchez launched a one-out, solo home run over the left field wall, The Register-Guard wrote. Guanchez went on to hit six home runs for the Emeralds that year, his third as a pro. He played one more year in the minors and several more in his native Venezuela, but he never made the majors. Guanchez' career began in 1988, signed by the Royals as a free agent out of Venezuela. He attended Colegio Ciudad Fajardo. Guanchez started with the Royals in the rookie Gulf Coast League. He hit .262 in 27 games there in 1988 and .332 in 59 games back there in 1989. In July 1989, he won GCL player of the month honors. He also made the league all-star team. He moved to short-season Eugene for 1990. He got into 66 games there and hit .263. He knocked in two runs on a double in a July game. In the field, the first baseman had a .998 fielding percentage. Guanchez played 1991 at single-A Appleton and showed his glove again. He turned in a .991 fielding percentage and hit .279 at the plate over 109 games. 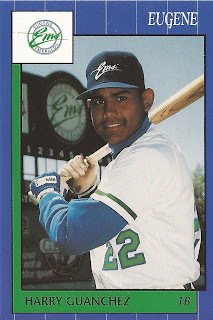 Guanchez didn't return to the minors, but he is credited as playing in Venezuela for the Tiburones de La Guaira through at least 1996. Guanchez has since gone on to coach in the U.S. and overseas. He spent time in Louisiana as an instructor in 2015. He's also served as a coach in Italy, as well as a manager.